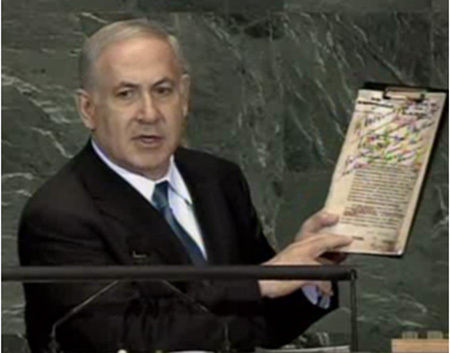 The simple answer to Netanyahu’s question is, yes, this is a lie. An outright, shameless, blatant lie. 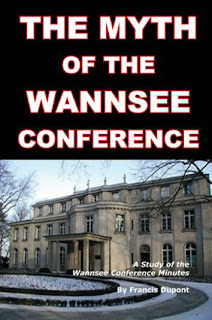 The actual minutes of the Wannsee Conference can be read in their entirety—in the original German here, and in full English translation, thanks to the work of Francis Dupont, in his small book The Myth of the Wannsee Conference ($6.95 on Amazon). I cannot recommend that book enough. - The Wannsee Conference also made allowance for specific exceptions to Jewish evacuation, such as Jewish German World War I veterans; ALL Jews over the age of 65; and ALL Jews working in industries vital to the German war effort, to be released from the threat of evacuation and be allowed to stay in Germany. There is therefore, no justification for the allegation that the Wannsee Conference was a ‘master plan for mass murder’ and everyone who claims this to be the case, from Netanyahu down, is simply lying. 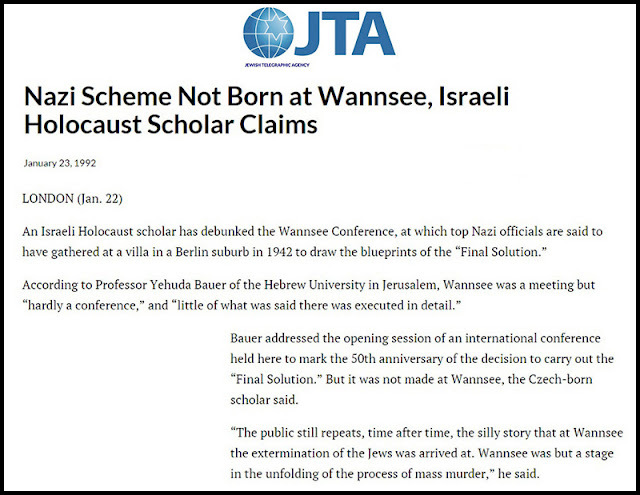 That the Wannsee Conference never discussed killing Jews in any way, has actually been confirmed in public by Yehuda Bauer, professor of Holocaust Studies at the Avraham Harman Institute of Contemporary Jewry at the Hebrew University of Jerusalem. 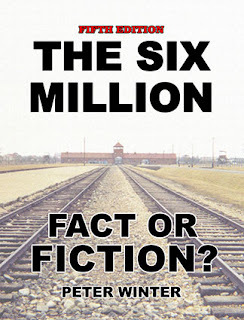 Bauer is also the founding editor of the journal Holocaust and Genocide Studies, and a member of the editorial board of the Encyclopaedia of the Holocaust, published by Yad Vashem in 1990. He is not, therefore, as some Holocaust storytellers claim, some obscure figure, but a leading and major—in fact, one of the most senior—Jews promoting the Holocaust fable. Bauer’s remarks were reported in the Jewish Telegraphic Agency of January 23, 1992, and the Canadian Jewish Times of January 30, 1992. Bauer addressed the opening session of an international conference held here to mark the 50th anniversary of the decision to carry out the "Final Solution". "But it was not made at Wannsee", the Czech born scholar said. "The public still repeats, time after time, the silly story that at Wannsee the extermination of the Jews was arrived at, Wannsee was but a stage in the unfolding of the process of mass murder," he said. 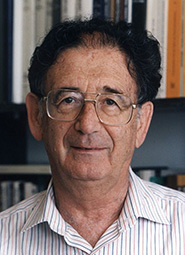 In other words, even the leading “Holocaust scholar” in Israel knows that to claim that the Wannsee Conference was all about “killing Jews,” or as Netanyahu told the United Nations, that the minutes contain “precise instructions on how to carry out the extermination of the Jews . . .” is an outright lie, a "silly story." 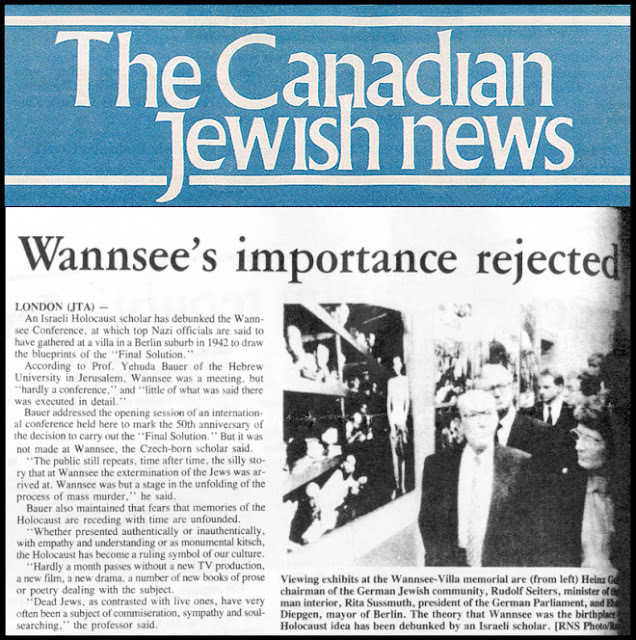 Once again, like everything else associated with the “Holocaust,” the Wannsee Conference myth collapses when subjected to even the most basic investigation.